I have yet to meet a product from Classical Academic Press that I did not at least like. We're getting to the point where we own quite a few (my reviews are linked)... from Latin program (Latin Alive and Song School Latin) to Logic (Art of Argument and Discovery of Deduction) to Greek (Song School Greek). 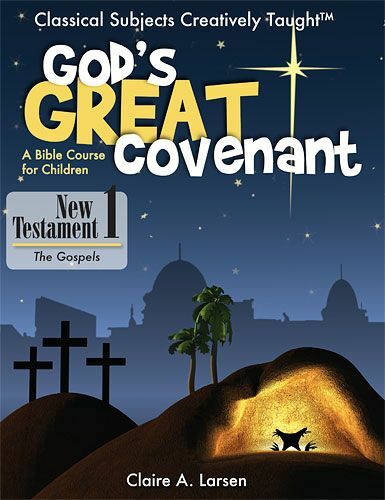 Recently, we have had the chance to fall in love with their Bible program, God's Great Covenant while working with their New Testament 1 Bundle. What a fabulous program! The publisher recommends this for 4th grade and up, but I ended up pulling everyone in for this. I had my 5th and 7th graders doing the workbook aspect, but the 9th, 2nd and Kindergartner were listening in to the readings. I love when I can use a Bible resource for everyone. God's Great Covenant will be a four-volume series (two for the Old Testament and two for the New Testament). Each volume includes a student book, a teacher's edition, and a set of mp3 audio files. The material is divided into four units of 9 lessons each (so 36 weekly lessons in all) plus a whole bunch of introductory material. This covers the gospels. God's Great Covenant New Testament 2 will cover the remainder of the New Testament, focusing on the story of how Jesus' disciples took the gospel message throughout the world. a Historical and Political Introduction, which covers the various empires in Palestine, and specifically what was happening politically around the time of Jesus. I completely lost my 2nd grader and kindergartner in this part. a Religious Introduction, which covers a whole lot of ground as far as what synagogues are, the role of the Temple, the Sadducees and Pharisees, scribes and priests. I lost my little two in this section too. A Daily Life Introduction, where we "meet" Simon, a fictitious boy who lives in a fictitious Jewish village near Cana. He is used here and in the unit wrap-ups to talk about what normal life was like in this time. Each unit starts off with a couple pages of introductory information (which we easily incorporated into the first week's lesson. 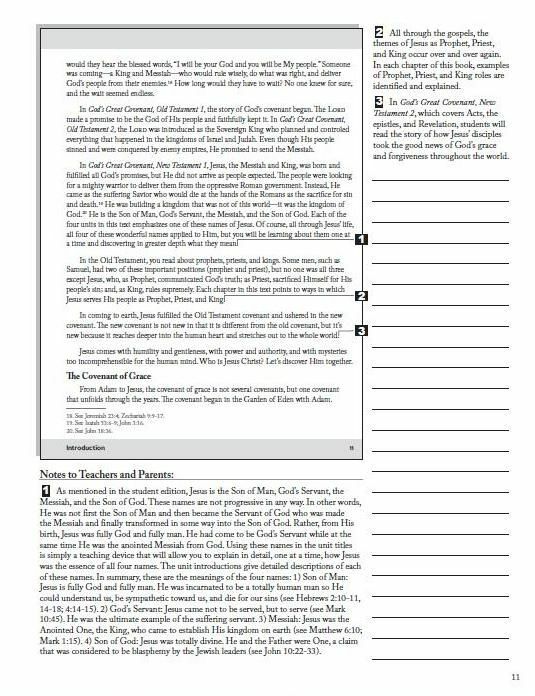 Each unit ends with summary worksheets, including memory passage worksheets, a devotional guide, and a Simon's World section. We haven't gotten this far yet, but I am sure we will spend a week wrapping up each unit. Within the unit, each lesson contains a story time section (which you can listen to on the mp3 audio files) and which includes charts and maps. There are also two pages of review worksheets, and a memory passage of a verse or two. The Teacher's Edition is fabulous, with the student pages included (and large enough to actually be read!) along with extensive notes and study helps for the teacher. Since I am using this with a high school and junior high student, we are making use of these notes. I typically let the little two run off while we talk over these extra details. We are enjoying this study, and I will be purchasing the New Testament 2 when it comes out. We haven't spent nearly enough time studying the New Testament! It is likely we will backtrack and use the two Old Testament volumes too. The New Testament bundle, which includes both the student and teacher books, and the audio downloads, is available for $56.95. Items can also be purchased separately. I loved your tone in this review and the links to the other reviews of their products. I will definitely be checking out the logic ones when my littles get a little older. I know that this will be a great curriculum for us for the next several years.